FABTECH 2018, North America’s largest metal forming, fabricating, welding and finishing event, welcomed more than 1,500 exhibiting companies and a total of 33,755 attendees from 75 countries to Atlanta’s Georgia World Congress Center from November 6-8 to celebrate manufacturing at its best. With more than 650,000 net square feet of exhibit space, FABTECH offered visitors the chance to network, learn and explore three exhibit halls full of new products, technology and the latest manufacturing innovations. The event showcased several emerging technologies including additive manufacturing, automation systems, advanced fiber laser cutting machines, and more. Attendees benefitted from the hands-on product demonstrations and expert insight into current and future manufacturing trends. Education continues to be a cornerstone of FABTECH, with an extensive lineup offered of more than 130 expert-led presentations and sessions covering the latest and best practices in the metal forming, fabricating, welding and finishing industries. The most popular education tracks focused on automation, robotics, cutting and lasers, welding fabrication, lean, and workforce development. New show floor features also gave attendees an unparalleled glimpse into the technologies driving the future of the industry. The Smart Manufacturing Hub featured displays and daily presentations on advanced manufacturing technologies including automation, IoT, 3D printing and more. An expanded 3D/Additive Manufacturing Pavilion introduced an Ask the Experts Knowledge Bar which hosted small group sessions designed to provide answers to specific 3D/additive manufacturing challenges. A variety of special events took center stage as well, including the popular FABx Tech Talks opening session, an inspirational keynote from NASCAR icon Kyle Petty, and an eye-opening panel discussion on the next generation entering the workforce. Recordings of the keynotes and panel discussions are available for purchase at FABTECHexpo.com/digital-package. 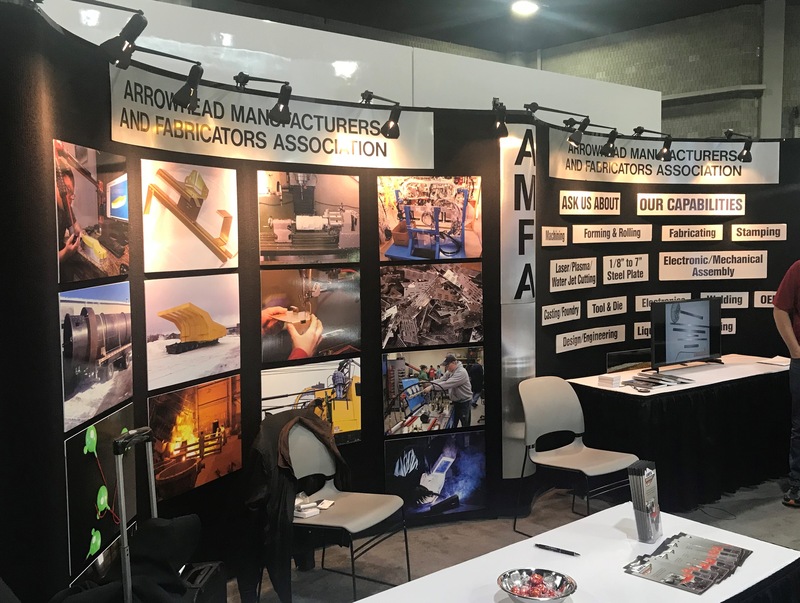 AMFA members were represented at FABTECH 2018 as the result of a partnership with the MN Department of Iron Range Resources & Rehabilitation (IRR). The two organizations collaborated to represent the manufacturing industry with a 20’ exhibit space staffed by IRR staff and AMFA volunteers. On behalf of the membership of AMFA, the board would like to say “thank you” to IRR for its role in providing exposure for AMFA members at such a significant venue. Many hours of volunteer time were dedicated to planning and preparing for the show. Sandy Bryant, Hibbing Fabricators; Dan Larson and Ben Larson, HydroSolutions of Duluth; Jim Petruga and Sean Smith, Northern Engineering; Ian Vincent, APEX; Jeff Borling, Great River Energy; and Seth Dostal, Scott Sundvall, and Matt Sjoberg with IRR served on the planning committee and assisted with setup/tear down and staffing the booth at the expo. Thank you to these dedicated AMFA volunteers! The AMFA exhibit booth is continually updated to have a greater impact on show-goers. Signage is focused on calling attention to specific manufacturing capabilities (welding, machining, etc.) of the AMFA membership, along with numerous photos depicting AMFA-produced products and components. AMFA Connection (AMFAconnect.com) was promoted again this year. Following the show, a “list of leads” gathered at the show was distributed via email to AMFA’s manufacturing members (contact the AMFA office to request the list). Last but not least, AMFA and IRR provided “transportation assistance” for two AMFA manufacturing members who attended FABTECH 2018: Hydrosolutions of Duluth and Northern Engineering.